Catalytic converter, Clamps, Cold air intake system, Exhaust Tip, Gaskets & Flanges, Header adapters, Heat shield, Heat-resistant hose sleeve, Motor mount, Muffler, Rubber bracket hanger insulators, Strut bars. 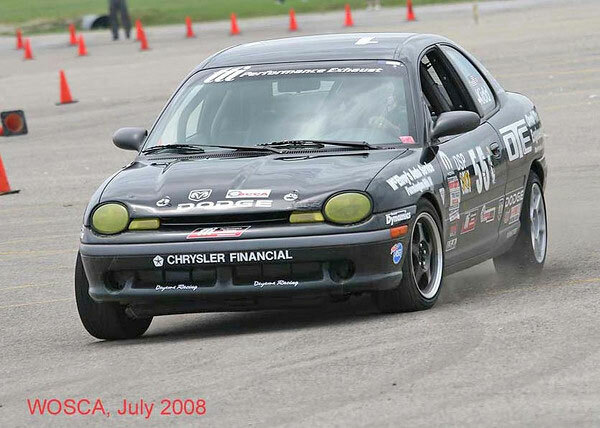 Our headers have proven to increase horsepower and torque, plus increases passing power! 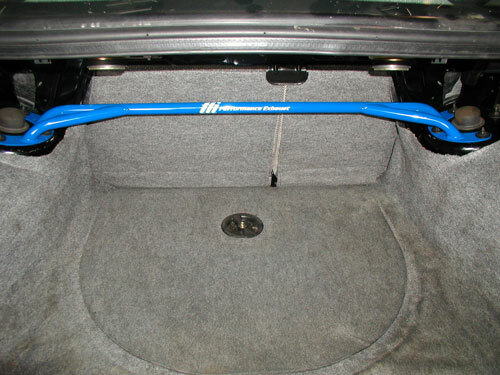 Heavy-duty materials are used to construct headers for the ultimate in durability and longevity. 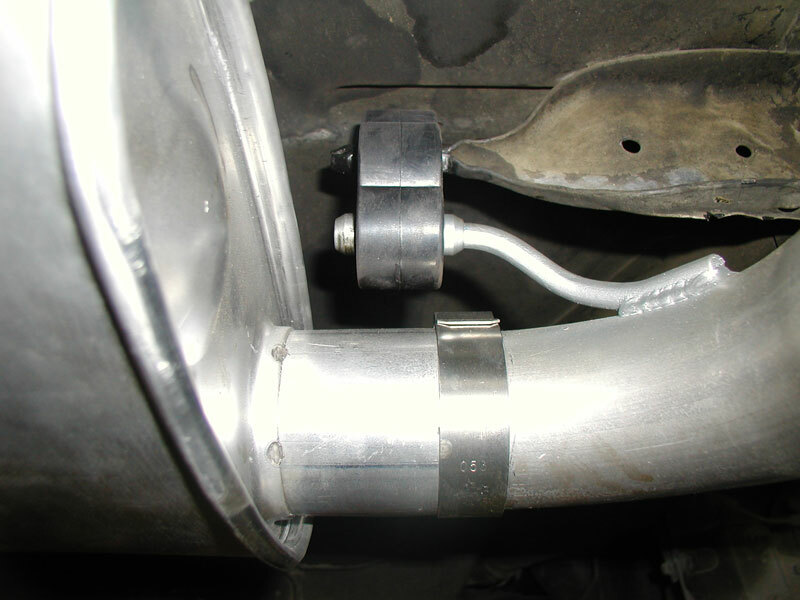 Systems are mandrel bent on sophisticated computer controlled bending machines for precise fit and uninterrupted exhaust flow. The mandrel bending process maintains a constant inside diameter of the tube for a smoother finish with no restriction of flow and no crimping of the tubes. Collector equipped with O2 sensor bung, ready to accept sensing equipment. 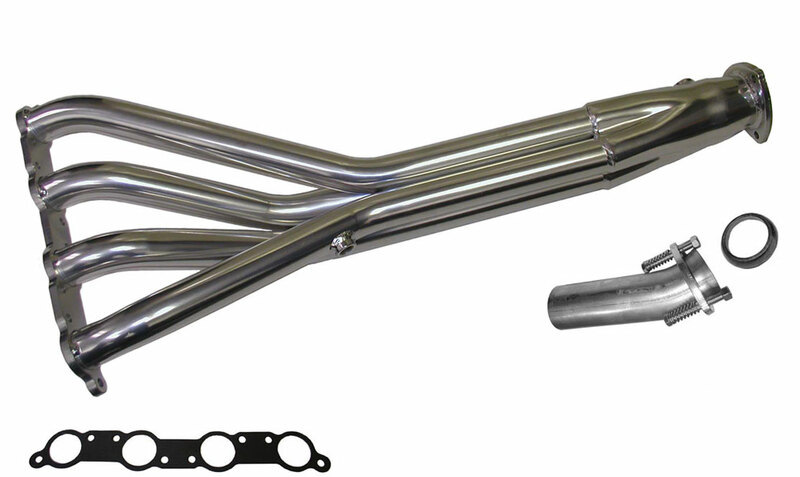 One piece header tubes, no slip tubes. Constructed of 16 gauge mild steel tubing. 3/8" thick laser-cut header & collector flanges, contoured for a leak free fit. Direct bolt-on fit, no welding required. 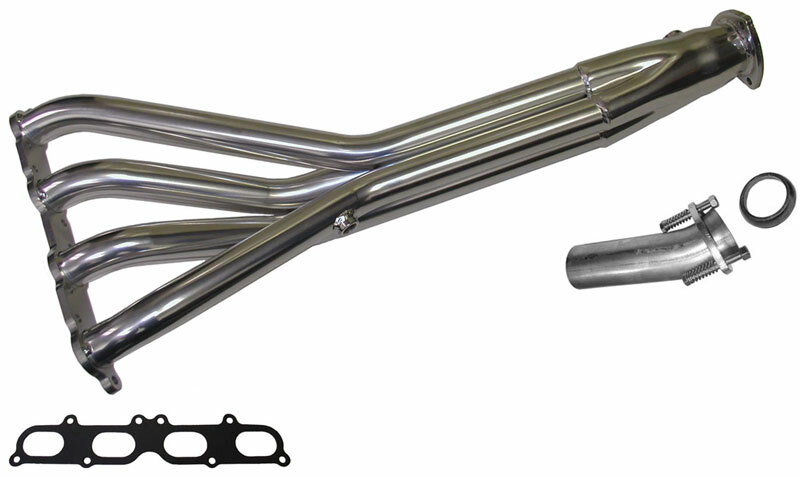 Includes Header Gasket, 4-5/16" Exhaust System Adapter #NAD37, Donut Gasket, (3) Socket Bolts, Springs & Lock Nuts. (!) Mounting bolts not included. Use the stock mounting bolts to secure the header. Includes Header Gasket, 9" Exhaust System Adapter #NAD38, Donut Gasket, (3) Socket Bolts, Springs & Lock Nuts. 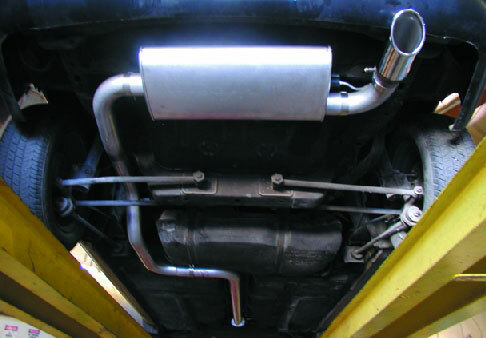 Our exhaust systems are constructed of 16 gauge aluminized tubing to resist heat and corrosion damage. 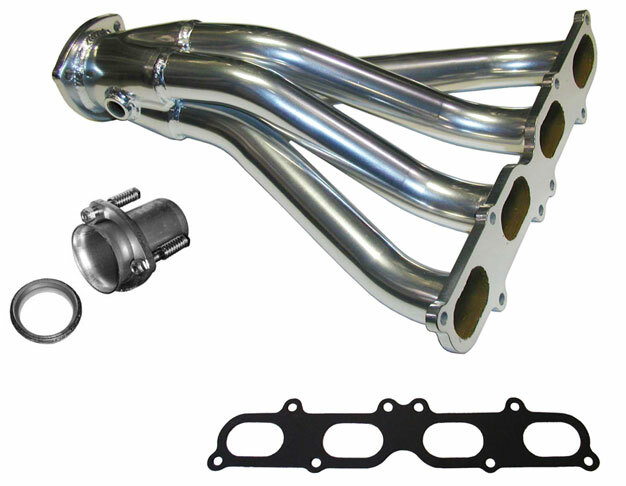 Fabricated in-house using sophisticated CNC machinery and mandrel bent for precise fit and uninterrupted exhaust flow. 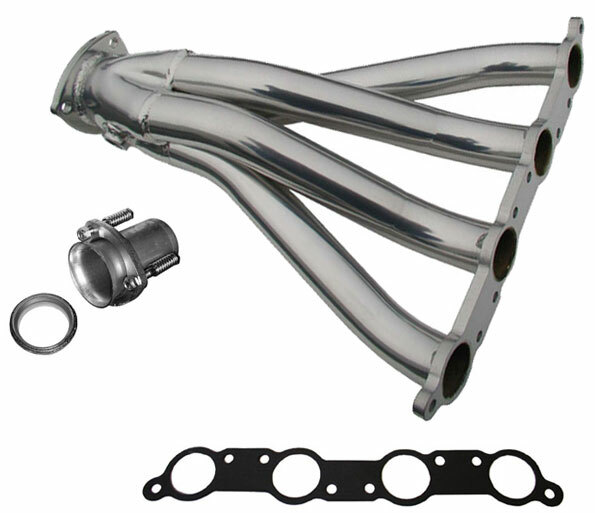 6-Section Exhaust System: Catalytic Converter w/ Extensions, Front-pipe, Over-Axle pipe with welded hanger brackets, Dynomax Super Turbo Muffler, Outlet-pipe with welded hanger bracket & Round Rolled-edge Polished Exhaust Tip. 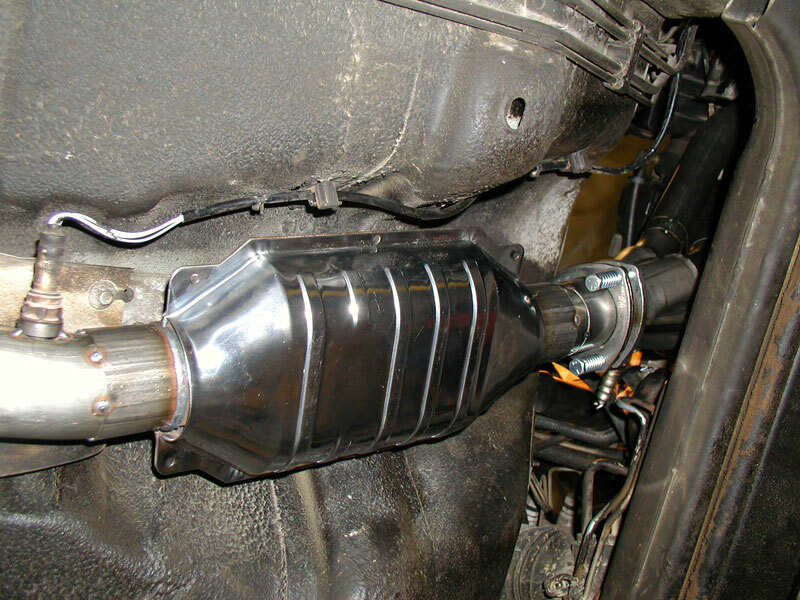 Catalytic Converter w/ Extensions equipped with O2 sensor bungs. System includes (5) Band clamps, (3) Rubber bracket hanger insulators, (3) Socket bolts, Compression springs & Lock nuts. Made of 16 gauge aluminized tubing, mandrel bent. (!) Prerequisite: Short Tube Header. Customer Notification and Disclaimer of Liability: These products are generally not legal for sale, or use in California, unless such parts are installed on vehicles that did not come originally equipped with a catalytic converter, or are installed on off-road or racing vehicles which are never used upon California highways. Use on California State and Federal highways is a violation of the EPA Clean Air Act. By purchasing the aftermarket TTi Performance Exhaust & Header products, purchaser relieves and indemnifies Tube Technologies Inc. from any and all related costs and liabilities, and assumes any and all risks and liabilities associated with the use and application of such products. 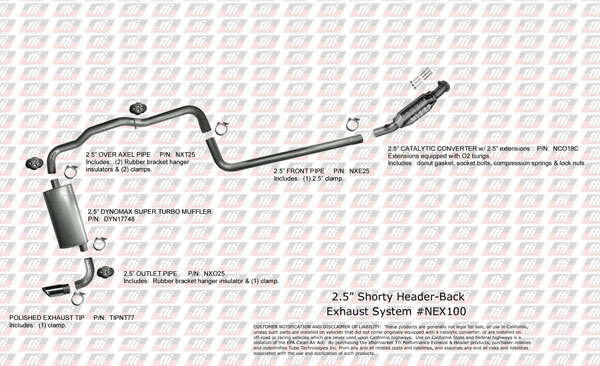 5-Section Exhaust System: Front-pipe, Over-Axle pipe with welded hanger brackets, Dynomax Super Turbo Muffler, Outlet-pipe with welded hanger bracket & Round Rolled-edge Polished Exhaust Tip. System includes (5) Band clamps & (3) Rubber bracket hanger insulators. (!) Prerequisite: Long Tube Header. 4-5/16" long. Includes donut gasket, socket bolts, compression springs & lock nuts. 9" long. 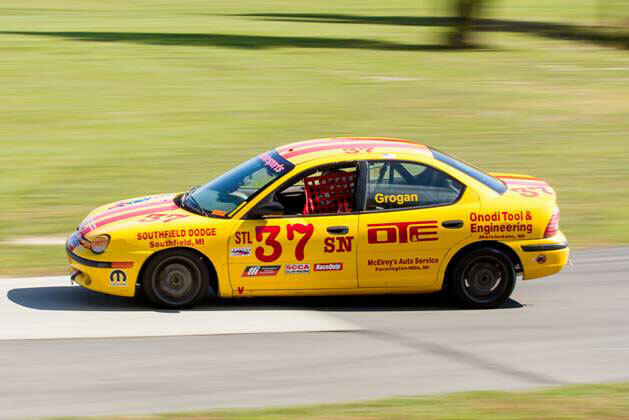 Includes donut gasket, socket bolts, compression springs & lock nuts. 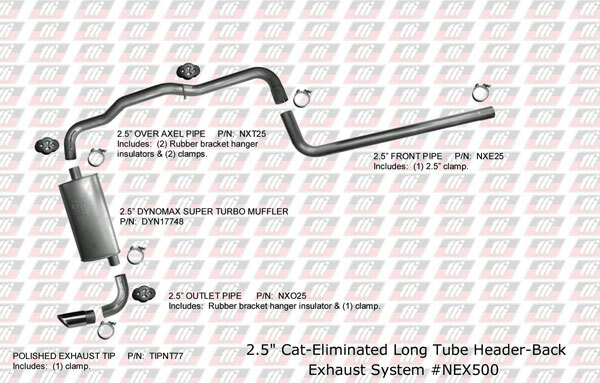 MagnaFlow Cat 445006 with 2.5" extension pipes. 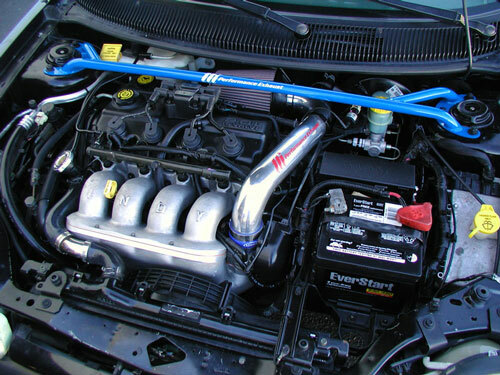 Extensions equipped with O2 sensor bungs. Includes donut gasket, socket bolts, compression springs & lock nuts. 9.75"W x 4.25"H x20.0"L, 25.5" Overall length. Includes a hanger bracket welded onto elbow & a rubber hanger bracket insulator. Rolled-edge, slip-on design. 2.5" O.D. inlet x 3.0" I.D. x 9.5" long. Includes band clamp. Includes Air filter, Air intake tube, Heat-resistant hose sleeve, 2.5" band clamp & 3/4" hose clamp. Part No's: NA600-PO Polished aluminum $ 141.95 ea. Includes Heat-resistant hose sleeve, 2.5" band clamp & 3/4" hose clamp. 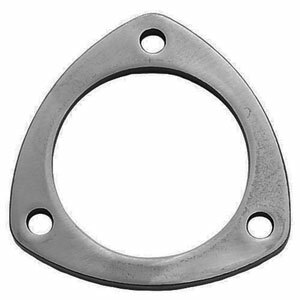 Part No's: NA659-PO Polished aluminum $ 98.95 ea. A universal, high-flowing air filter for cold air intake installation on a round pipe. 2.5" ID Inlet, 9" Overall length, Round tapered shape. 5-1/8" top diameter x 5-3/4" bottom diameter. 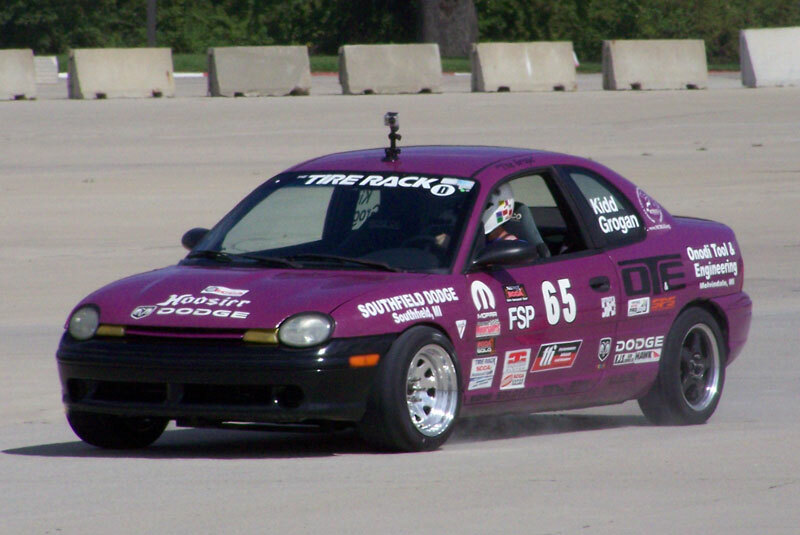 Increases stiffness and reduces body rolling during cornering.